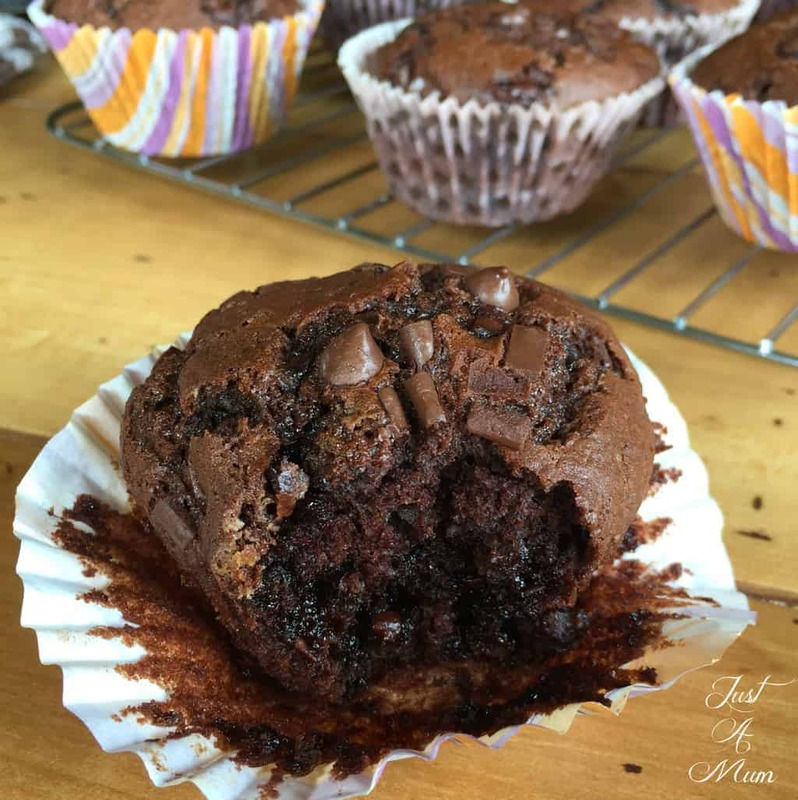 When it came time to write up this post I realised that I had already given you another delicious version of a Double Chocolate Chip Muffin recipe, so the brilliant title of Double Chocolate Chip Muffins 2.0 came from a handsome group of 11 year old boys who were my official taste testers! 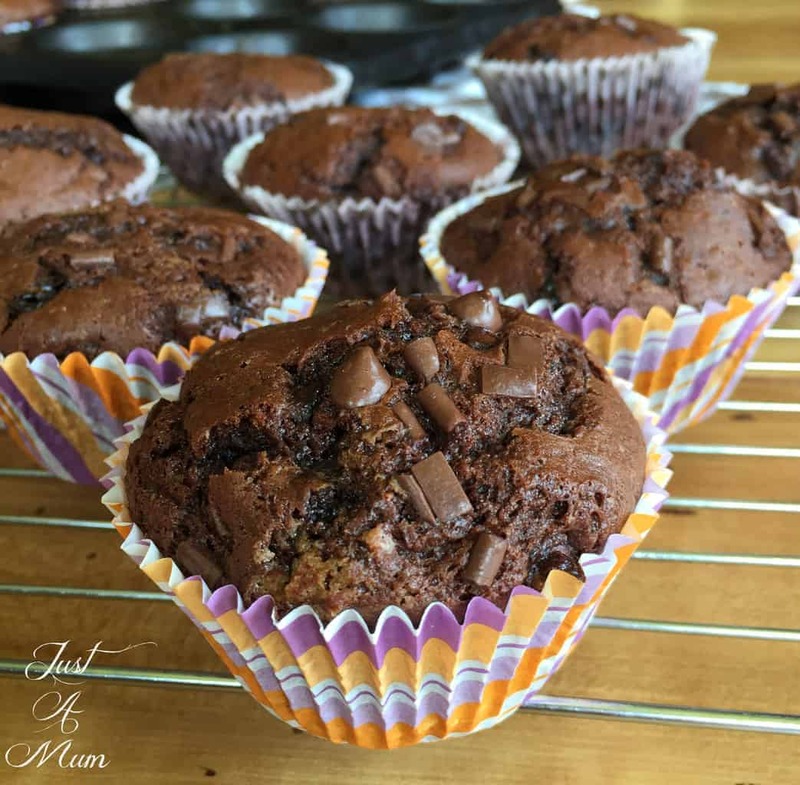 Today I wanted to make up a batch of muffins that would be quick and easy, plus satisfy the group of friends my son had over – so the answer of course had to be chocolate! That and my cupboards are looking pretty bare at the moment so my options were rather limited. 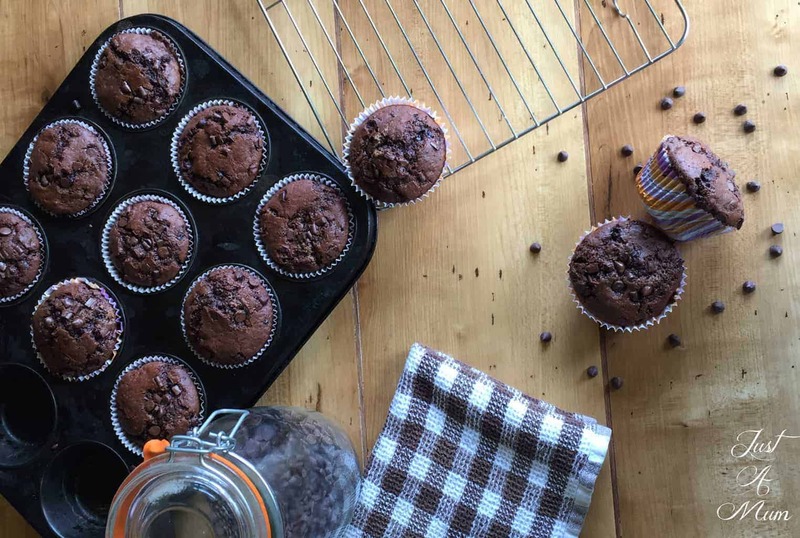 Most double chocolate muffin recipes I find have either yoghurt like my Double Chocolate Muffins 1.0 or sour cream. The reason for this is the moisture and denseness they provide. They also have a good quantity of fat, so best to use full fat versions in both cases. It adds a lovely texture unlike many other muffin bases. 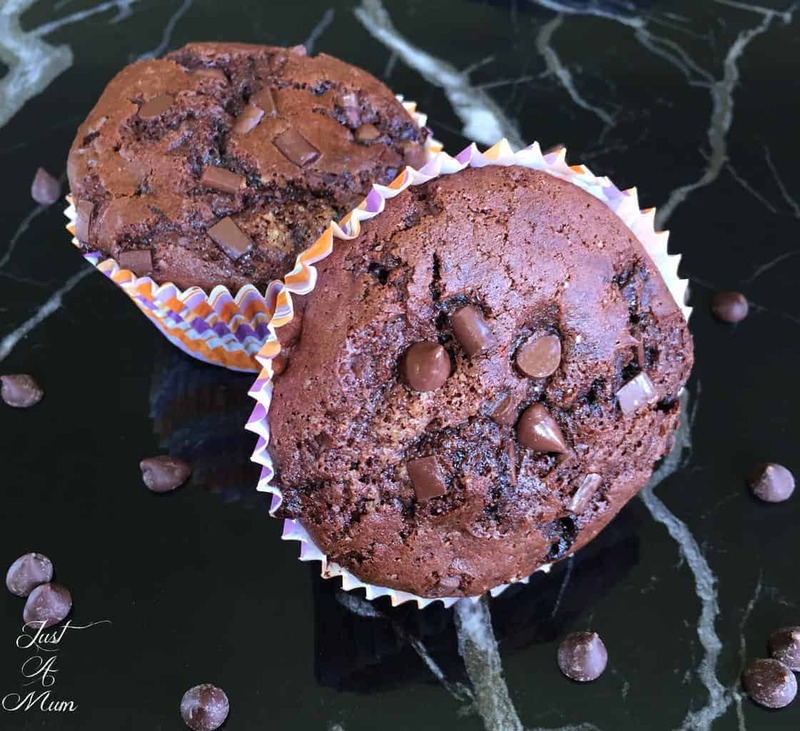 You really want a chocolate muffin that is a CHOCOLATE muffin – by which I mean if you are going to go to the effort of making this delicious treat then you really cannot scrimp on the chocolate!! Chocolate by way of cocoa, chocolate chips inside (or big chunks if you prefer) and if you like a sprinkling on the top too. I think muffins are so much better fresh, these warm from the oven is the ideal way to eat them but if you are having them cold then a quick 13 seconds in the microwave should do the trick to take you back to fresh oven ready muffins! And of course if you want to go one step further with muffins that are a few days old you cannot go wrong with heating them and adding a dollop of cream or ice-cream! 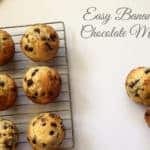 In many countries muffins are considered breakfast food, I perhaps wouldn’t go that far with this particular recipe! For me that may be a gateway drug to starting to eat caramel slice for lunch, but they are certainly a lovely way to get a gorgeous tasty fresh bit of baking in your day. They will freeze beautifully so would be perfect to take out one to pop in lunch boxes or to have on hand for unexpected visitors. 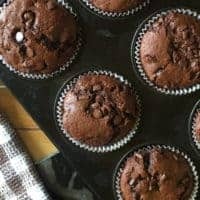 This recipe makes 12 good sized muffins, feel free to double the recipe if you wish to freeze some. Makes lovely mini muffins to, simply halve the baking time. So onto the recipe, you do want to cream the butter and sugar so a food mixer will make this step much easier, it is only a small quantity of butter so you could do it by hand and build up some good baking muscle! From that point on it is just a matter of adding all of the ingredients one by one, then baking! 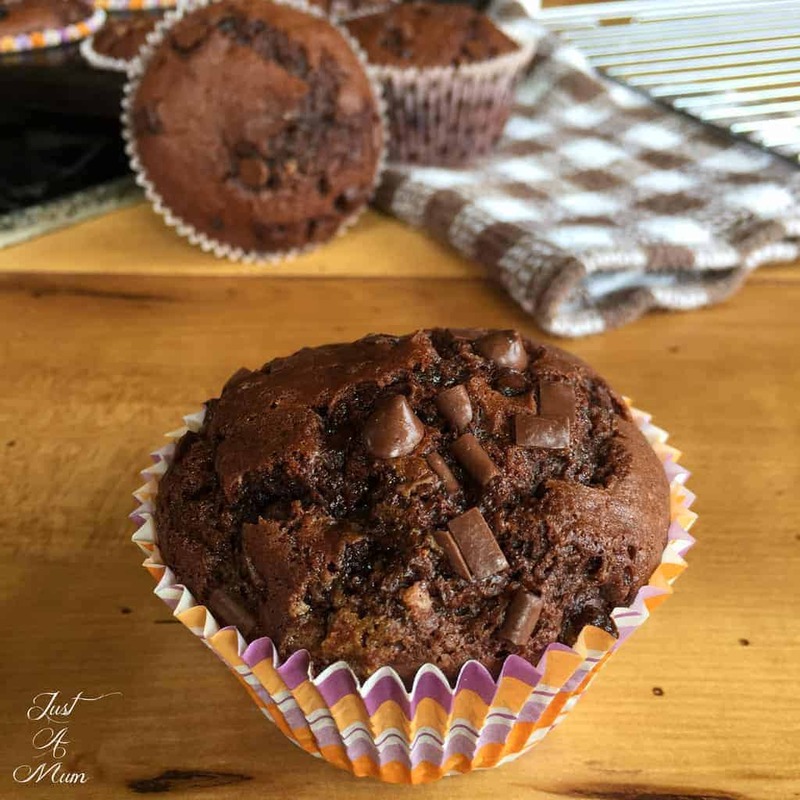 The perfect muffin recipe, simple & delicious! Prepare a muffin tray with paper cases or spray well with cooking oil. In a large mixer bowl add the softened butter, white and brown sugar and cream well until pale and creamy. Add the vanilla and combine well. Add the cocoa powder to the bowl and carefully blend in, then scrape down the sides and beater and blend again. Add half the flour and half the sour cream and mix, then the other half of both and stir gently to fully combine. Spoon the batter into the prepared cupcake cases until 3/4 full. If using sprinkle with a few chocolate chips to finish. Bake for 18-20 minutes until they spring back to the touch. Remove from the oven and allow to cool for 5 minutes in the tray, then transfer to a wire rack to cool completely before storing in an airtight container . And there you have it! Another great and delicious recipe to add to your baking repertoire. 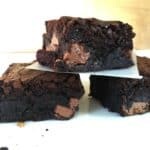 You can never have too many chocolate ingredients and this is a great one to keep in mind, especially if you have left over sour cream to use up! You can replace the sour cream if needed with full fat Greek yoghurt. This may slightly alter the taste and texture but not too much given these quantities. 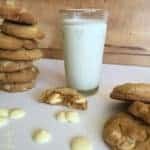 I hope you enjoy this recipe, check out my other sweet recipes in the tabs above, lots to try and all of them delicious and tested by me! 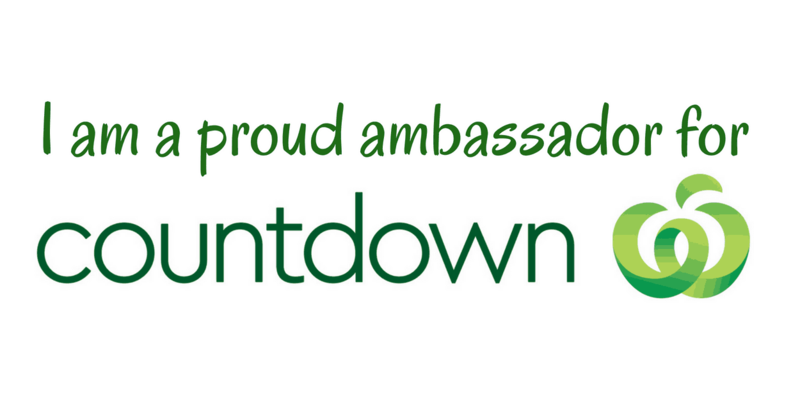 Be sure to follow me on Facebook & Instagram and you can also subscribe to my email list to be the first to receive my recipes as I post them in the subscription box below. 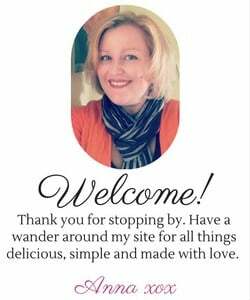 Thanks for stopping by, Happy Baking! OHH my these look so good ! 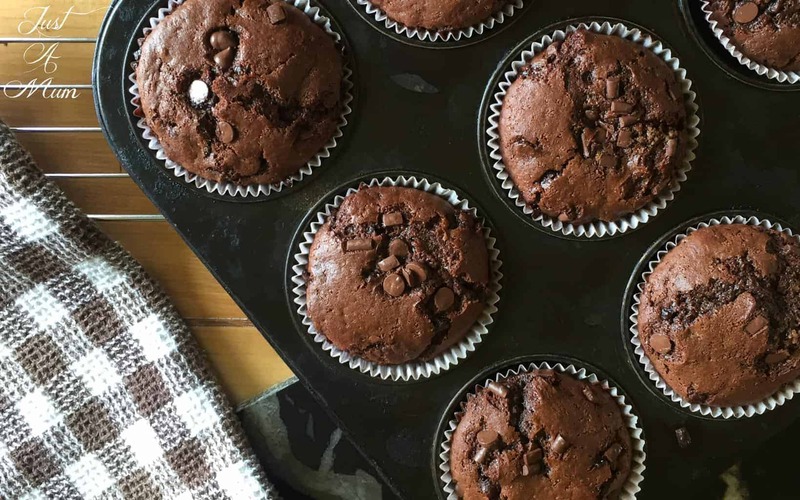 what are the little square pieces of chocolate in your muffins ? ?